This air track provides a frictionless surface that is indispensable for studying the mechanics of linear motion. 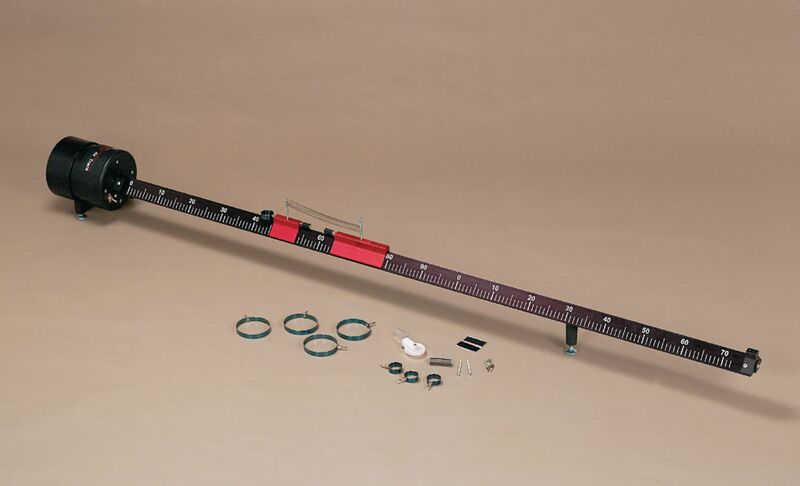 This apparatus features a 110V built-in air source, a sturdy, 1.8 m anodized track with a large, easy-to-read metric scale, an air adjuster at the end, and three leveler feet. It also comes with a complete set of gliders and accessories. The Air Track can measure velocity in one dimension, allowing students to investigate acceleration, collisions, explosions, momentum, and simple harmonic motion. Ordering information: This kit includes an air track with built-in air supply, 1—15 cm anodized glider, 1—7.5 cm anodized glider, 4 large bumpers, 4 small bumpers, 1 set of mounted magnets for elastic collisions, 1 set of dashpot and coupler for inelastic collisions, 2 weak springs, 1 pulley, and 1 hook and loop tape set.